Newly appointed Associate, Simon Maggiora. Simon is a Senior Geotechnical Engineer with 13 years’ experience, which the past three of those years has been within the Core team. His substantial experience has been gained working on mining and civil infrastructure projects throughout Queensland, New South Wales, Victoria, Western Australia, Papua New Guinea and Indonesia. Covering a wide variety of fields, including civil design and construction, geotechnical site investigations, foundation engineering, slope stability, landslide remediation, erosion and sediment control, acid sulfate soils, numerical modelling, effluent disposal and earthworks. 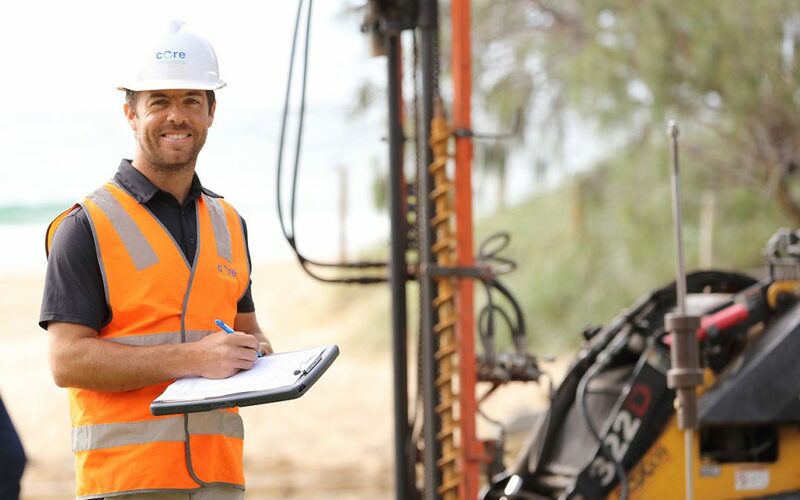 Simon’s ability to plan and execute tasks to a high standard and to provide meaningful interpretation and rational geotechnical solutions to set deadlines has gained the respect of peers and clients throughout his career. Simon prides himself on building and maintaining strong client relationships by being responsive, easy to do business with, and providing practical solutions to complex problems. With extensive project experience in many large Australian Engineering jobs, such as Toowoomba Range Slope Stabilisation, Emerald Flood Protection Scheme, BHP WAIO Project – FMG Rail Overpass, Port of Brisbane Land Reclamation and the list goes on. We are very privileged to have Simon as a new Associate to Core Consultants and are very much looking forward to the new projects and direction Simon will be a part of.